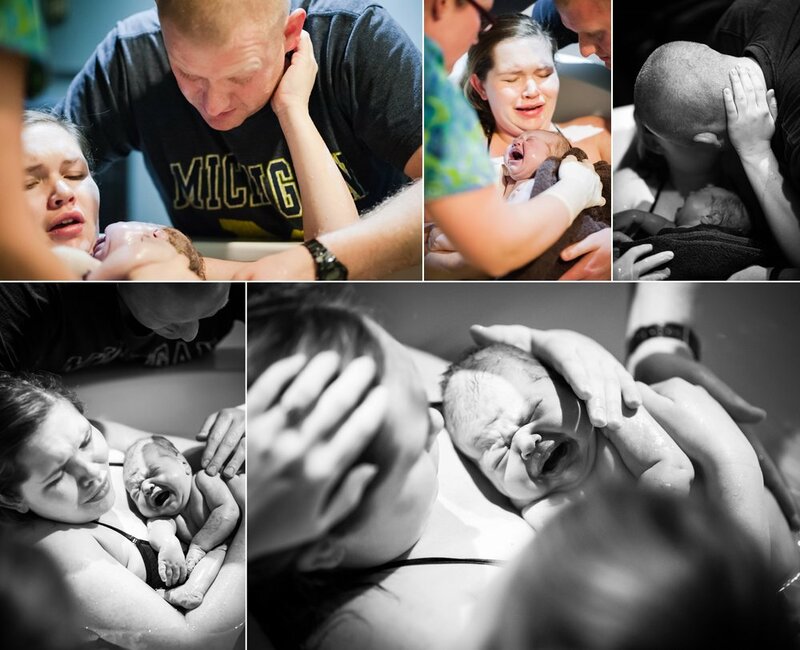 A few months ago I had the incredible experience of documenting another birth photographer's birth. 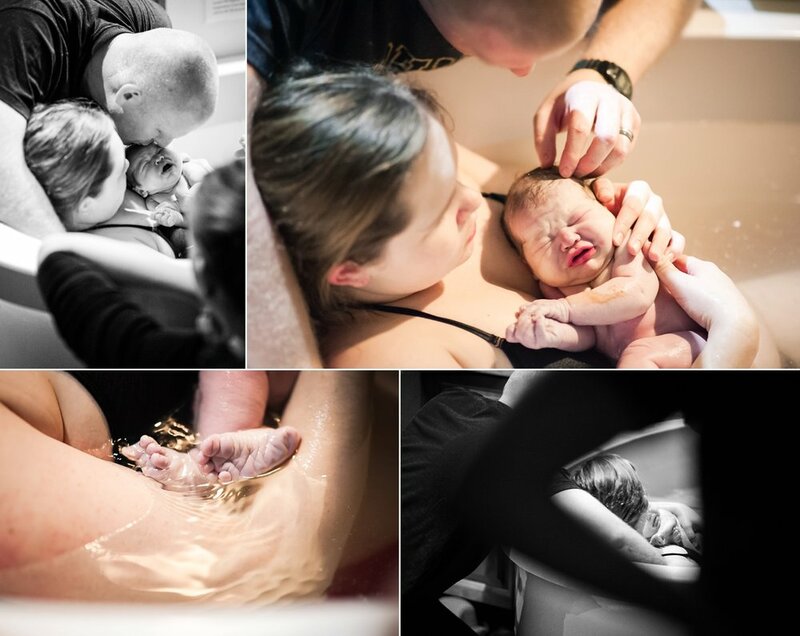 Taylor Bercot of Leigh Rose Photography is the mama in question, and she was kind enough to allow me to share her birth story here. It was a powerhouse of a water birth that left behind an oxytocin high for everyone there. The Birth of Edyn Grace, by Taylor Bercot. As many of you know, my husband and I just welcomed our second child into the world! Edyn Grace made us wait for her arrival, but finally— at 41 weeks and 6 days — she was in our arms. I wanted to make sure I wrote her birth story as soon as possible so that the birth was still fresh in my mind. I had my dream birth with Edyn, and I want to remember every detail. Throughout my pregnancy, I received my prenatal care at Alaska Family Health and Birth Center because I wanted a peaceful waterbirth. I was also seen there during my first pregnancy, but I risked out of their care at 39 weeks due to high blood pressure. I loved the midwives and the facility, and I prayed that this time, I would get the birth that I dreamed of. So here it is: the story of the birth of Edyn Grace Bercot. 41 weeks + 5 days pregnant. The birth center’s policy is that at 42 weeks gestation, you risk out of birth center care and have to transfer to the hospital. In other words, I had roughly two days left to go into labor, or I would again have to transfer care and have a hospital birth. Knowing this, the midwives and I used my routine prenatal appointment as an opportunity to sweep my membranes to see if we could get labor going. I had irregular contractions for a few hours, but nothing crazy. I was pretty scared that it wasn't going to work and that I would have to go with the last-resort plan of taking castor oil in the morning (...it’s really gross). Little did I know, Edyn was on her way. My contractions started becoming regular and timed about 7-8 minutes apart. I wasn't really sure what to do but I couldn't sleep, so I went downstairs to let Elliott sleep and tried to just rest and listen to my body. Every time I would get up to do something, the contractions would come faster, so I tried to lay down on the couch. When I had a few contractions that I actually had to breathe through, I knew that this was the real thing. At that point it was hard to sit still! I was ready. I started getting our toddler’s bag ready to go to our friends’ house and tried to clean up a little bit, but it was getting a lot harder to function. The contractions were getting a lot stronger and closer together, so I woke Elliott up and he took Leighlyn to our friends’ house. While he was gone, I decided to get in the shower. At that point, the contractions were coming around every 2-4 minutes. I was really confused — things seemed to be happening super fast and I had been sure that my labor was probably going to last a while. When Elliott got home he timed my contractions and was shocked. He immediately called the birth center and told them we were coming! Elliott got everything we needed into the car and we were off to the birth center to have our baby girl! The car ride was absolutely miserable. I thought it would never end. The contractions were coming so fast I felt like I wasn't getting breaks in between them. They were super intense, and every time I thought I figured out how to cope, the next one would come even stronger and more intense. I remember keeping my tones low instead of high, something I always had in the back of my mind. I knew the nice low moans were going to help my body open up. Elliott was amazing at reminding me to breathe and stay low. I would guess that during the car ride the contractions were closer to 1 minute apart. We arrived at the birth center and hurried in. The midwife started filling up the tub right away and I worked through some contractions while Elliott brought our stuff inside. Another midwife checked Edyn's heartbeat and took my vitals. My amazing doula Kassandra arrived and started helping me through each contraction. Elliott was right there, too; by my side, encouraging me through each one. I knew that I was going to be kind of loud during my labor, which is kind of weird because I am NOT a loud person. But I knew that it would help me cope to be vocal through my contractions, and it did. The birth tub was ready and I got in. Around this time, I started feeling urges to push. It definitely felt good to push during some of the contractions. This got me excited, but at the same time I was still super confused because this labor was going SO FAST! I didn't want to get my hopes up, because in my mind I was thinking maybe it wasn't actually going that fast and I was just being a wimp! One of the midwives checked me and I was around 7-8 cm open. This is definitely where I hit my wall. I wanted to go to the hospital, I wanted to give up and just cry. I thought for sure I was going to get stuck here and that it was going to be hours before I had my baby in my arms. The contractions were so strong and I'm not sure how far apart they were, but they had to be less than 30 seconds. I was feeling like I needed to push during every contraction now. After a few more contractions, I felt Edyn’s head with my fingers and I was shocked! I remember asking my doula if that was her head. I don't remember getting an answer, but Elliott said that everyone said yes, that's her head! I'm pretty sure I was roaring through some of my contractions now, and I distinctly remember my pushing sound being different than my coping-through-a-contraction sound. This whole time, I was on my hands and knees in the tub because that was the most comfortable position. The midwives suddenly said they could see her head! They needed to listen to her heart, so Elliott and my doula helped me turn and I felt her head starting to come out. It seemed like forever that her head sat there. I remember the midwife saying her forehead was out and I needed to push really good to get that head out. Edyn was born! They handed her right to me (and just like I wanted, this is where she stayed for the next two hours). I could not believe that she came that quickly. I was so amazed that I actually did it. I had a baby with absolutely no drugs, in a tub, not in a hospital. Within her first few minutes, Elliott, who was sitting outside of the tub right next to me, prayed out loud. He thanked God for a safe and quick delivery while I cried. God answered our prayers. He gave me the strength to have this baby and He allowed us to have the birth that we wanted. Minutes later, the placenta was delivered and everyone helped me out of the tub. We got into the bed and I held Edyn on my chest while the midwives checked to see if I had torn. I was expecting so because of how fast she came (and I had needed stitches after Leighlyn’s birth). Thankfully, I only had a tiny little tear and it didn't need stitches! Again, I was amazed. My body did exactly what it was supposed to, and I really believe that being in the water was one reason why I didn't tear badly. For the rest of the night we were able to just relax. Edyn stayed on my chest (still connected to the placenta) and we let her figure out breastfeeding without a million people trying to force her onto my breast (I did not have a good experience with breastfeeding in the hospital after Leighlyn was born, so this was a huge deal). It was SO calm and relaxing. Edyn didn't sleep at all and just kept making the sweetest little sounds that weren't cries, but almost sounded like she was talking to us, telling us about her experience. We were all laughing at how cute she sounded! My doula and photographer were both there, and we talked about everything that had just transpired. Around 2 hours after the birth, Elliott cut the cord and got to hold her for some skin to skin. The midwives weighed and measured Edyn: 8 pounds, 6 ounces, and 19 inches. One of the best things about giving birth at the birth center is that we were able to go home after 6 hours. We ended up leaving around 10AM that morning and headed back to the comfort of our own home. I am so thankful for my amazing husband who supported me and really wanted the same kind of experience as me. I'm also thankful for my amazing doula, Kassandra. She was there for both of our babies' births and I really could not have done it without her. She was the calm that Elliott and I both needed through both birth experiences. I am so ecstatic about the way Edyn’s whole birth went. It was really exactly what I wanted and I am still on cloud nine. I have never felt so strong and so empowered.